The apartments are finely decorated and furnished in traditional Florentine style without losing touch with all the modern amenities. Located on the second floor of an old building with no elevator, both apartments have a bedroom, a fully equipped open-plan kitchen, a spacious bathroom with a large shower, a large living room with exposed wood beams, TV, table, chairs, sofa bed for two and a sleeping loft, 1.60 m high, with another comfortable double bed. For cancellations within 20 days prior to the arrival day we charge the 15% of the total amount. For cancellations within 3 days prior to the arrival day we charge the 40% of the total amount. Please note that the prepayment is non-refundable, not even in the case of force majeure. For check-in from 19:00 there is an extra charge of 30 €. For check-in from 00:00 there is an extra charge of 50 €. In case you want to store the luggage in the apartment later than 10:00 you must call us the day before your exit day and we will let you know if it is possible. Late check-out is possible till 12:00 and there is an extra charge of 50 €. The apartment Calimaruzza is located in Duomo area. 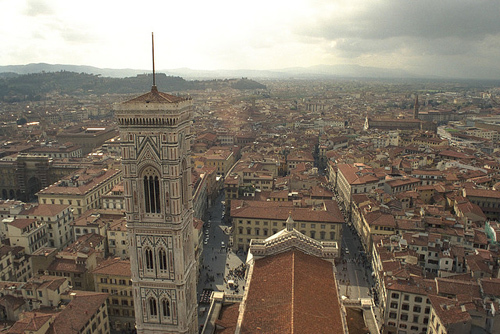 Our Apartments are located in Duomo area, in a walking distance from all the main monuments and attractions: Palazzo Vecchio, the Dome and the Baptistry, Uffizi Gallery, Pontevecchio, Bargello Museum, etc. Uffizi Gallery - 0.21 km. Ponte Vecchio - 0.27 km. Brunelleschi Dome - 0.40 km.